These Ten Commandments were passed down to me by Captain Mark Davis, while I was a rookie sawyer / swamper with the Feather River Handcrew on the Plumas National Forest. Never in my life had I met a guy as colorful and unique as Captain Davis and I doubt I ever will. His stories were epic, and his endurance was legendary. He was a tall-tale brought to life, and he left an impression on everyone he crossed paths with. He certainly wasn’t a man without faults, but in the two years I worked with him, he earned my lasting respect. He truly loved being a wildland firefighter and I always admired his love of the job. It was infectious. I’m not sure if he’s the original author of this, but I believe that he either wrote or received them while serving on Yosemite National Park’s Helitack crew, no doubt longing to hear the ear-shattering screams of a red-lined Stihl, augured into a monster sugar pine. 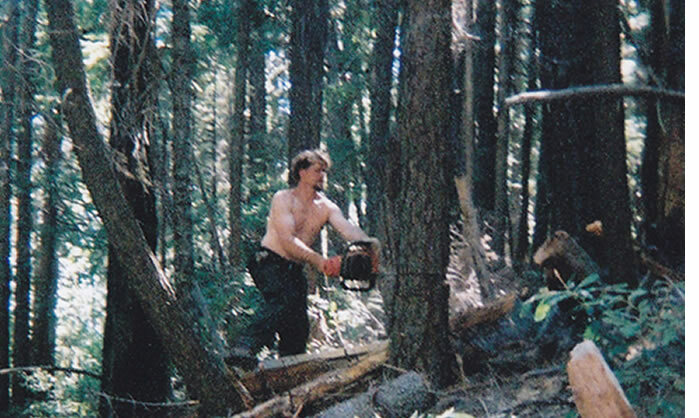 Sadly, Captain Davis’ career was cut short by a career-ending accident, but his commitment to the chain saw, and the strange bond that grows between a sawyer and his saw, will continue to be passed on. Thy saw is a temple, put only the best into it. 92 octane mixed to perfection. They saw breaths – keep its filter clean. Love they chain for it does all the work, keep it sharp at all times, seek perfection in its sharpening. Keep thy bar straight and true, file off burs, clean out chain grooves and oil holes, keep its tip lubed. Keep thy needle bearings lubed. Thou shall keep thy saw clean, never put it on the shelf dirty. Keep thy saw ready for battle at all times, know its tanks are topped off, and its chain ready to cut, then and only then may you rest the saw or yourself. Thou shall thoroughly clean around thy carburetor, piston cylinder, cooling fins, magneto, and air intake slits. Thou shall know thy saw, as one knows the members of their own body. Thy saw is an extension of one’s own self, seek oneness with it. Captain Davis loved firefighting, but I think he loved being a sawyer the most. The violence, the power – everything about it drew him in, and it never let go. Even though his days of storming up and down the line, barking orders are past, those who served with him will remember him as the craziest son of a gun they ever met.